ZIP and RAR are the file compression formats. You can only see the content if you have any software which an read or extract these files. For extracting all files, you only need to right click on the file and then select “Extract All” option from contect menu. But if there are multiple ZIP files, we can only extract all files one by one. 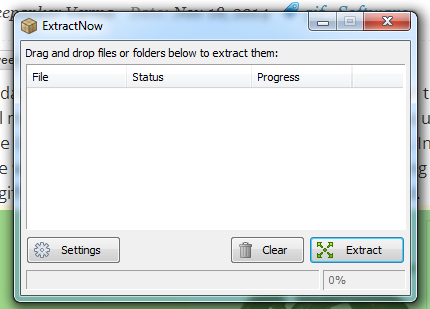 If you want to extract batch of zip files, you can try ExtractNow. ExtractNow lets you easily extract multiple zip or RAR files in one go. Download ExtractNow and install in your system. Portable version of the tool is also available. While installing the ExtractNow, you should be careful. It may try to suggest few third-party tools which are not recommended. 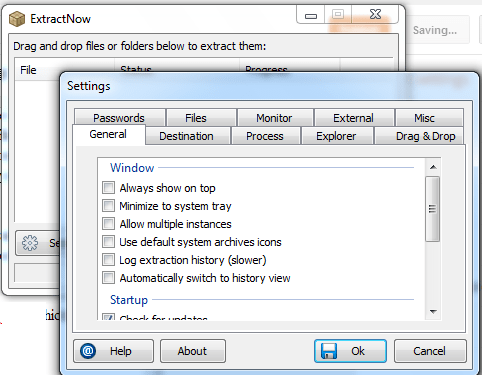 Be sure to skip for those options.ExtractNow has a very basic window with few options. Drag and drop all the ZIp/RAR files which you want to extract in one go. And then click on extract button, It will open a browse for folder window to select destination to extract all the files. Then press OK to extract all the files. In the settings, you can change various options like default dictionary list for password, output destination and few other basic options. I do not think that there is any need to explain these options. You will easily understand all those things. This tool works in all available version of Windows. Not only ZIP and RAR, it also supports many more compressed file formats. SO, you can try this utility if you want to quickly extract multiple files.